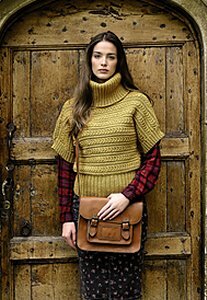 Taken from the Rowan Website: "Knit this womens cable sweater from the Pure Wool Worsted Collection, designed by Martin Storey using the gorgeous yarn, Pure Wool Worsted (superwash wool). Knitted sideways from cuff, with a simple yet effective cable stitch pattern, deep ribbed welt and cosy turn back ribbed collar, shawl collar and turn back cuffs, this knitting pattern is suitable for the intermediate knitter." This pattern is from Pure Wool Worsted Collection, pg 25 - Alba. Size US 6 & 7 straight needles and a US 6-24" circular needle (or sizes needed to obtain gauge), and a cable needle are required but not included. Gauge: 21 sts 29 rows over 4"
Color Shown is #133 Gold.